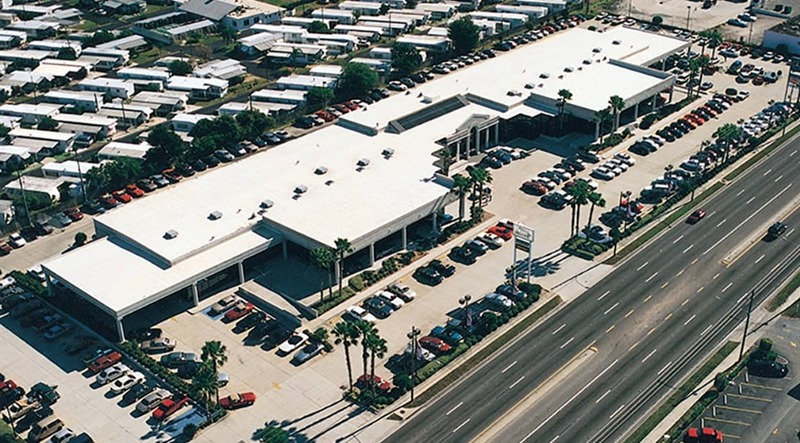 Crown Motors in St. Petersburg, Florida, conquers leak problems with FiberTite® roofing membranes. Location: St. Petersburg, FL U.S.A.
Metal roofs in Florida are particularly vulnerable to deterioration from thermal shock and foot traffic to maintain A/C equipment. Typically, the roof at Crown Motors Jaguar-Mercedes Showroom in St. Petersburg, Florida had ongoing problems with leaks. The leaks began shortly after the building was constructed in 1988, with one of the biggest problems being the internal gutter system. McEnany Roofing, Inc. of Tampa, Florida, was selected to assess, evaluate and recommend a solution. Prior to this, Crown Motors was faced with a $500,000+ metal roof retrofit. McEnany Roofing accepted the challenge and, with the assistance of the technical department of Seaman Corporation, designed a metal roof overlay using a FiberTite® Roofing System. The challenge was having to span 4” wide flutes; this was accomplished by fastening 20-gauge galvanized “hat channels” centered over the high and narrow flutes. This allowed a solid substrate to be fastened to 1/2” plywood, providing a continuous smooth flat surface to install the FiberTite Roofing System. Also, by lining the gutters entirely with the FiberTite membrane, their roofing problems were resolved at a significant savings over their original plan to replace the metal roof and gutter. In 1995, McEnany Roofing was then contracted to install the new roof as designed. Despite inclement weather, windy days and the meticulous measures taken to protect the cars, McEnany completed the job in eight weeks.